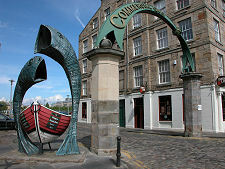 Leith has been an active port for at least a thousand years. 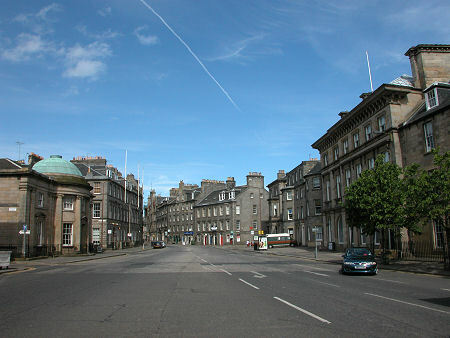 In 1329 control of it was given by Robert I to the Royal Burgh of Edinburgh and since then the two have grown together, steadily eating away at the mile or two of open land that once separated them. 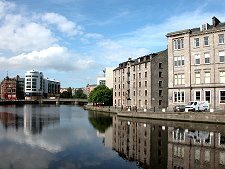 Leith and Edinburgh now blend seamlessly together, just a short ride apart on one of the many connecting buses or an invigorating walk for those who enjoy exploring their cities on foot. Anyone who has read Irvine Walsh's Trainspotting will feel they know all they need to know about Leith, and steer well clear of it. 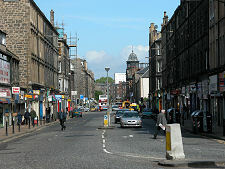 Yet today's Leith would be barely recognisable to the 1993 characters of the book. Over the past decade what was a typically rough-edged large seaport has turned into something very different. Today's Leith is a fitting foil for Edinburgh's Athens of the North; and while calling it the Venice of the North might be going a little far, the ongoing development of its many waterfront areas into smart (and expensive) flats; into restaurants and bars; and into shops and offices is certainly pushing it in that direction. 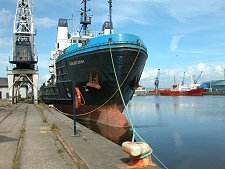 What's happened over the past decade has been the steady retreat of Leith's port activities away from the southerly docks and the mouth of the Water of Leith and into the outer, northerly, docks. And as the port activity has retreated so the developers have taken over. 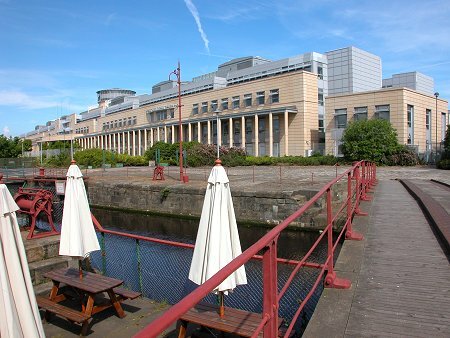 The turning point was probably the decision to build Victoria Quay. This vast office building was completed in 1995 on land formerly between two docks. It now houses much of the Scottish Government. For some years afterwards small high quality developments popped up across Leith in a pepperpot fashion, leaving an oddly fine grained mix of new and old. 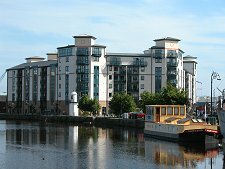 But by 2008 the sheer number and scale of new developments had transformed the overall look and feel of Leith. Whole swathes of derelict warehouses had been converted to residential or office use, or simply swept away and replaced by sympathetic and well planned new buildings. 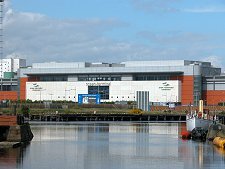 An important arrival was the huge Ocean Terminal shopping centre, again on a dockside location. 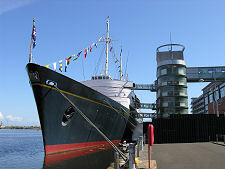 This is also home to the Royal Yacht Britannia, bringing its own steady stream of tourists from Edinburgh City Centre. Leith is now also a frequent port of call for cruise liners. And the change is spreading. Ambitious development plans on the drawing board or currently underway are consolidating the change in Leith's fortunes and spreading it along the River Forth to what was once the separate fishing village of Newhaven and beyond. But while parts of Leith have changed beyond recognition in recent years, a great deal of the magnificent architecture from earlier waves of investment remains on view. Leith's dominance as a port, especially after Berwick on Tweed became permanently English in 1482, meant there has always been a great deal of money here, though always very unevenly distributed across the population. The rich shipowners and merchants have always wanted fine places to live, and much of what they built is still here. 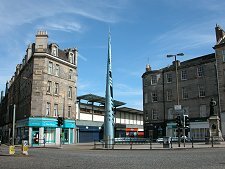 Leith has not neglected its history. 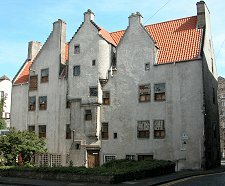 Obvious examples of this remains in the form of Andrew Lamb's House, built in the early 1600s on the site where Mary Queen of Scots dined on her return from France on 19 August 1561. 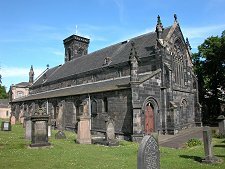 A number of other buildings remain from the later 1600s, while the South Leith Parish Church contains the core of an earlier church built in 1483. 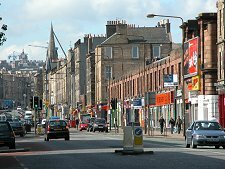 There looks to be every chance that Leith will manage that very difficult trick of reinventing itself for the Third Millennium while still retaining much of its distinctive character. 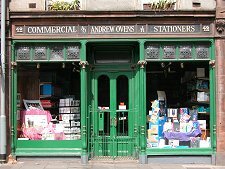 So if you're in Edinburgh, ignore decade old impressions gleaned from Trainspotting and get on a 22 bus from Princes Street; or one of the many tourist buses going to the Royal Yacht Britannia: or just take the fascinating two mile downhill walk to Leith.